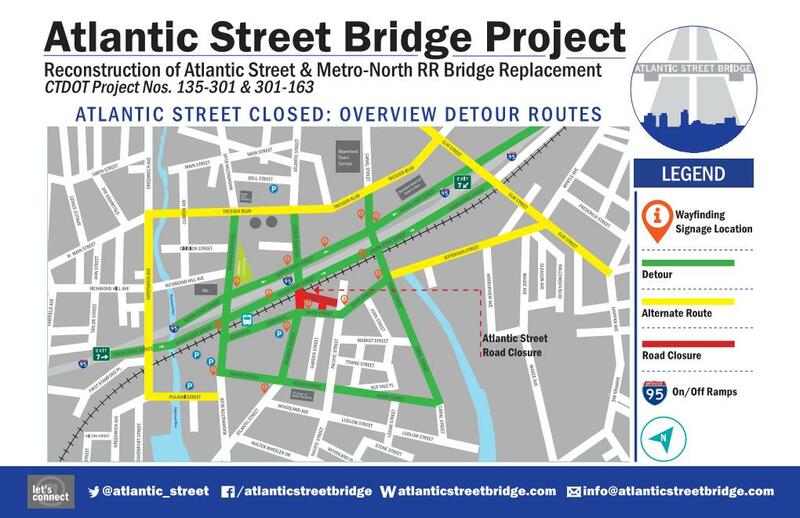 Residents, commuters and the traveling public are advised that as of February 19, 2019, Atlantic Street, between South State Street and Dock Street under the Metro North Railroad Bridge, will be temporarily closed to allow for concurrent construction operations to continue on Atlantic Street. Rail service delays are not expected and pedestrian access will be maintained under the Atlantic Street Bridge. Motorists are advised to follow detour signs and to allow for extra travel time. Click here for CT Transit bus stop changes along South State Street in effect during the detour period. Click here for CT Transit service changes on Station Place and Dock Street. During this closure, Atlantic Street will be widened, the new bridge abutments will be constructed, and the bridge superstructure will be assembled on the southern side of the existing bridge on Atlantic Street. The replacement bridge will be rolled into place from June 28-July 8, 2019. Rail service will be fully restored on or about July 8, 2019. South State Street will be closed on or about June 28-September 8, 2019. The new, wider bridge will accommodate a new Track #7 for dedicated local train service. In addition, Atlantic Street under the bridge will be widen to accommodate 3 southbound and 3 northbound lanes and lowered to increase the vertical clearance under the bridge to 14’6” to better accommodate commercial and emergency vehicles. It is expected that on/about September 8, 2019, all roads will re-open. A special Metro North Train Schedule will be issued on June 29, 2019 during the bridge replacement roll in time frame of June 28-July 8, 2019. Click here for that schedule. Starting Thursday, July 26, 2018 the following lane closure will be in effect daily, until further notice. South State Street between Atlantic Street and the traffic signal at the NB Exit 8 Off Ramp touchdown will be reduced to one lane. This lane reduction will be required for the next several months to construct a new retaining wall to support the new Track #7 with its own dedicated platform. 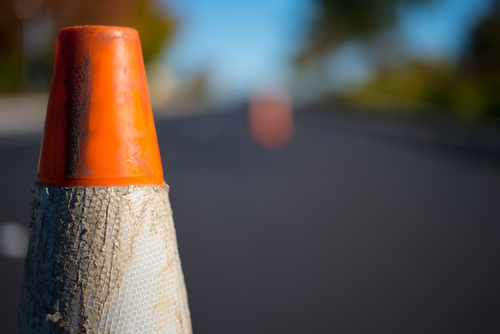 Please note that during this project there may be road closures, lane changes and/or detours related to utility work in the area that will not be captured on this website. Motorists and pedestrians should be aware that modifications to the proposed schedule, including postponements and/or extensions may be necessary due to weather delays or other unforeseen conditions.